Canadian Radar Station (CRS) Falconbridge (later CFS Falconbridge), located near Sudbury was built in 1950 as part of the Pinetree Line, a series of 33 radar stations stretching from coast to coast across Canada. The main purpose of these stations was to detect and identify unknown aircraft and then dispatch interceptor aircraft to the targets, when necessary. The station was officially opened in 1952 and became known as RCAF Falconbridge. 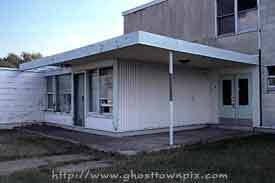 Like most post-war military facilities, it was fully self-contained community. At its height it included a school, library, church and infirmary. The recreational facilities were quite lavish and included a bowling alley, recreational hall, gymnasium, sauna and wading pool. Housing came in the form of 101 private homes, as well as shared quarters. The radar facility was rendered obselete following computerization during the mid 60s. The station was redesignated for alternate purposes a number of times. Following the closure of CFS Foymount in 1974, it assumed additional radar scanning duties. The station remained operational until 1986, when it was officially decommissioned and closed. The station was subsequently sold to private interests for a fraction of its value and in turn flipped several times. When last seen, many of the homes were rented and occupied, while the remainder of the base sat crumbling.